The grand-daddy of them all—almost 8 square feet of cooking space on a stainless steel cooking grate, easily controlled with a turn of the handwheel for the ultimate in heat control. Weighing in at 750 lbs. 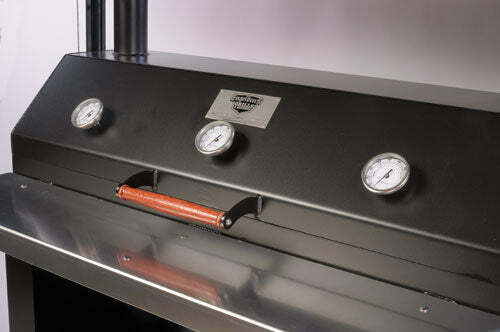 we can assure you that it's also the most heavy-duty, longest lasting backyard grill on the market. Cook on a wood fire any day of the week. The Stahlkammer's 10 gauge .1345" thick steel lid and 1/4" lower body can take the heat—well above 1000 degrees. All of Engelbrecht's grills are manufactured with quality materials and not a single ounce of plastic, so you have a grill you can pass down to your grandkids. Every detail is thought out for longevity, including the finish (1500 degree powder coating, UV resistant coating on the handles), overall build (cast iron wheels, 2000 lb. stainless steel aircraft cable, stainless steel fasteners, stainless steel thermometer, steel body hinges with naval brass pins), and the list goes on. 3/8" round solid stainless steel cooking grate that is 23" x 46.5"
The 2000 Series is built on a per-order basis. When your order is confirmed, we will begin the manufacturing process—ensuring that particular model will be your grill from beginning to end. When you order, please provide a phone number and valid email address. After you place your order we will be contacting you to confirm that we have received your order and to give an estimated completion and ship date. Shipping is by freight and for mainland US customers. Item can also be picked up from our Paxton, Illinois facility. Contact Engelbrecht Grills and Cookers for details. Please contact us for shipping outside the mainland US.